Runners run. Granted, the discerning observer will know that there are many different types of runs that endurance athletes can use to construct a complete training program. But, for the most part, runners aren’t the best about cross-training. Sometimes this has to do with personal preference. Others, though, avoid dedicating time and energy to other forms of training out of fear of decreasing their running performance. In truth, well-chosen cross-training routines can have a powerful positive impact on your runs. But, again, these workouts have to be “well-chosen.” Not everything will complement your runs well. So, what does? As it turns out, the ancient training tool known as the kettlebell can be an incredibly useful tool for the cross-trainer runner. How? What benefits do these uniquely shaped weights offer runners? 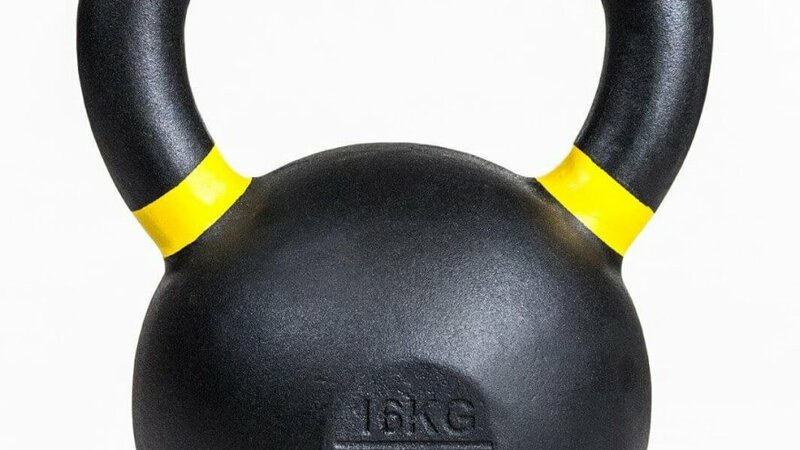 Due to their specialized shape – which closely resembles a ball with a handle on top – kettlebells allow for a wide variety of dynamic, explosive movements. What’s more, kettlebell exercises are generally of the compound variety, meaning that many muscle groups and joints are involved executing the movement. But how does these attributes specifically benefit runners? A 2013 study, sponsored by the American Council on Fitness, sought to answer this question by putting 18 volunteers through an 8-week long kettlebell training program. Each workout consisted of one- and two-handed swings, lunges, presses, snatches, cleans and Turkish get-ups. Before and after completing the routine, the participants went through a battery of tests to measure their body composition, flexibility, balance, strength and cardiovascular fitness. At the end of the 8 weeks, how did everyone do? Somewhat predictably, the kettlebell workout produced significant gains in the strength. What was a surprise, though, was how dramatic core strength improved as a result of the workouts. Because of the fast-paced and dynamic nature of the workouts, as well, the kettlebell group saw major improvements in overall cardiovascular fitness, creating a 13.8 percent increase in aerobic capacity. Interestingly, the kettlebell…ers also experience impressive changes in their balance and mobility. So, how does all of this relate to you as a runner? This study – and many like it – suggest that runners can benefit from kettlebell training in several ways. As mentioned, kettlebells provide a way for you to increase your strength and your endurance all at once, which is pretty cool. For the most part, though, the exercises featured in kettlebell workouts focus on explosive movements generated by your legs. And that sounds a lot like running. Kettlebell training, then, is an effective way to increase your speed, mobility, strength, power and endurance all in one fast-paced workout. The huge improvement in core strength – averaging about 70 percent – is also of particular interest here. While runners don’t often pay a lot of attention to their core, remember, those are the muscles that hold you upright. So that’s important. Having a strong and efficient core will support your posture and form, allowing you to move effectively both during your runs and throughout your daily routine. Similarly, the improvements in balance could translate to real benefits for safety-minded runners. A well-trained sense of balance will improve your overall form and efficiency of movement while also decreasing your risk of falls and other injuries. Kettlebells offer a host of unique benefits that can help to improve your runs. How can you incorporate this training method into your routine? First, it’s probably a good idea to spend a session or two with a qualified trainer. Kettlebells are a pretty specialized training tool and the movements can be fairly complex. Good form, then, is absolutely vital. A few sessions with a specialist, therefore, can set you up to be able to work through the movements safely on your own. Of course, if you’re feeling confident and already have a good understanding of basic lifting technique, you might be able to get by following a few videos on YouTube or elsewhere online. All that being said, here’s a basic kettlebell workout for runners. Perform three sets of 12 reps for each exercise, resting 60 seconds between sets. Use the heaviest weight you can without sacrificing form. 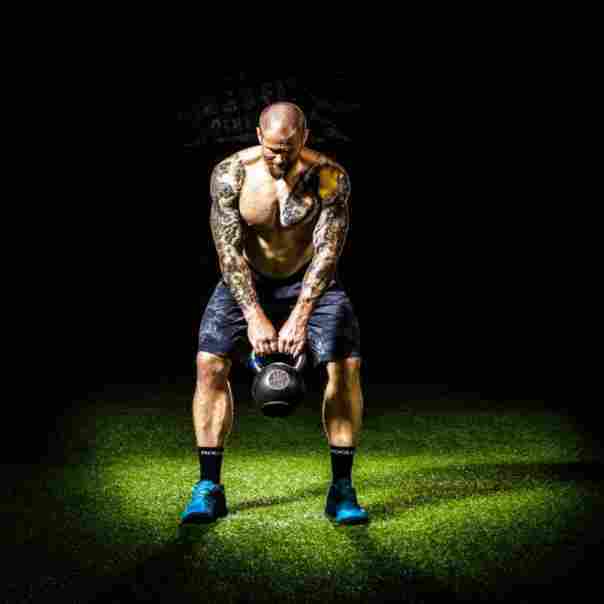 Stand with your feet slightly wider than shoulder-width apart and the kettlebell gripped by both hands. Keeping your knees soft and your back straight, hinge at your hips to drop the kettlebell between your legs slightly. Using your core and glutes, quickly swing the kettlebell up to shoulder height. Keep your arms straight and allow the momentum of your lowerbody to power the movement. Swing the kettlebell back down between your legs and repeat. Grab a kettlebell with your right arm and clean the kettlebell to your shoulder. At the same time, rotate your wrist as you do so that your palm is facing away from you. This is the starting position for future reps.
Keeping your core tight and your spine straight, bend your knees slightly. Driving through your heels, straighten your legs to generate momentum. Straighten your arm to lift the weight above your head, using the power of your legs. Slowly lower the weight to the starting position and repeat. Complete half the set with your right arm and then switch hands and repeat. Stand with your feet a little more than shoulder-width apart and hold a kettlebell with both hands, just below the handle. Bend your knees slightly to drop into a seated position, keeping the kettlebell close to your right hip. Press on your heels and straighten your legs to stand up right. At the same time, straighten your arms and twist your torso so that the kettlebell rises above your left shoulder. Stand upright with your feet about shoulder-width apart. Hold a kettlebell with both hands close to your chest. Lunge your right leg forward and extend your left leg to drop into a lunge position. At the same time, press the kettlebell directly above your return. Lower the weight as you return to the standing position.